Surface refinishing is a great way to update bathtubs, vanities, countertops, sinks, tile, and more; and no one is better at it than Miracle Method. While surface refinishing is faster, easier, and more affordable than replacing or remodeling, is it safe? Miracle Method is the only national surface refinishing company that does not use hydrofluoric acid in its refinishing process. Hydrofluoric acid is old technology and is used by most refinishers to etch a porcelain surface. It’s toxic, causes chemical burns and if not properly neutralized can corrode pipes when washed down the drain. Miracle Method uses MM-4, a proprietary non-acid bonding agent that is free of potentially dangerous or harmful chemicals. MM-4 provides superior adherence for coatings providing a durable, nontoxic finish that will enhance your home for years to come. When you hire Miracle Method to update your kitchen or bathroom, you can feel confident that the processes and materials used by our professionally trained technicians will be safe for you and your home. 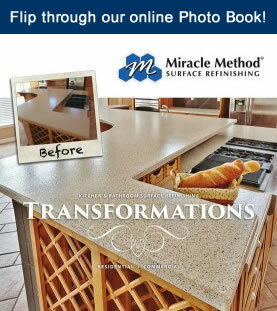 For more information about the many benefits of surface refinishing, contact Miracle Method today.